As I thought about what I wanted to say about this book I began to think about the main characters Julia and her husband the D.A. David Tanner. I thought about the suspense and twists and turns in the story. Then I thought about the title and how it fit into the characters and the story. And I realized the definition of 'Duplicity' tells it all. . . The story line is filled with characters that are dishonest, double-dealing, deceitful etc. etc. which for me made for a good story. Not necessarily a story that had me interested in becoming friends with or have coffee with a few of the characters. I enjoyed the story. It was a little slow in the beginning but there was a steadiness that kept me interested enough to stick with it till the tempo sped up to the roller coaster ending. I have no desire to 'spill the beans.' I just suggest if you like a good suspenseful story you'll enjoy Duplicity. There are a few bedroom seems. In fact the story begins with a scene that some people might read and stop then and there. That is not the theme of the book. Its a short part that sets the story into motion. There are a few descriptions of some sexual acts further into the story that are described by the police as a video tape is watched while the are gathering evidence. And there is a little graphic detail in some of the crimes that are committed. This didn't bother me. I just mention it because some people might wish to have a heads up. 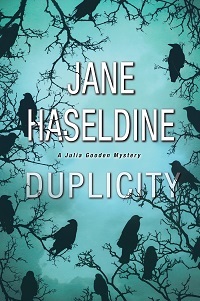 Overall I really liked Duplicity and look forward to reading additional books in the Julie Gooden series. I received a complimentary copy from TLC book tours. This review will appear on retail sites where the book is available. This review will appear on My Journey Back and Good Reads. I had a hard time choosing the character that I wanted to chat with. It was easy to know who I didn't want to 'get to know'. And actually it wasn't difficult know who to choose. The hard part was choosing 1. So I didn't choose 1. I chose 3. Never done before. Probably never done again. But here goes in no particular order. Character #1 is Salvator Gallo I suspect that if I was to sit, chat and consume some sort of beverage with 'Gallo' who is kind of a 'mob type' fellow but ends help helping Julie. He just seems like the character that I would love to see in another book. wheelchair bound. He has connections and associates that he utilizes to help get Julie out of some jams. And he 'knows' and has 'information' that helps Julie in her investigation. The last Character that I would love to share probably a cup of tea or coffee with is the neighbor/baby sitter Helen. Helen is a grandmotherly type woman that jumps in and helps with her children. Helen covers the home front for Julie when business and investigations call Julie away. Jane Haseldine is a journalist, former crime reporter, columnist, newspaper editor, magazine writer, and deputy director of communications for a governor. Jane graduated from Syracuse University’s S.I. Newhouse School of Public Communications with a degree in journalism. 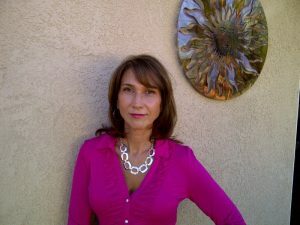 She resides in Southern California with her husband and two sons, but previously lived in Boston, San Francisco, New York, Rehoboth Beach, Delaware, Michigan, Pennsylvania, and Louisiana. Welcome Lesley to my little Reading Journey. I’m excited to talk a little about Old Bones Never Die. Before we get too deep into the bones of the story can you tell us a little about yourself. In my former life (before I retired to write mysteries) I was a professor of psychology and university administrator. I took an early retirement to move with my husband to New Mexico. He grew up in the West and always wanted to retire there, but somehow we eventually ended up spending half the year in Upstate New York and the other half in rural Florida. We’re both mystery writers and love writing in both locations. Since I spent much of my career in New York, the river valleys and mountains there speak to me and find their way into the setting of many of my books and stories. The same is true for rural Florida with its swamps, fields of grazing cattle and abundant wildlife. I love to cook, garden and work on the 1874 cottage we bought set on a trout stream in the Butternut Valley in Upstate. In Florida we enjoy exploring this unusual part of the state. I like being able to offer readers a setting they are unfamiliar with. How did you choose Florida as the location of the Eve Appel series. I chose rural Florida, off from both of its coasts because it is an environment not yet spoiled by too much development. It is a gem isolated in time, a ranching and farming area where spurs still jingle in the post office and you can rub elbows with a handsome cowboy doing a little boot scootin’ on the dance floor of a local country bar. Life here has been altered little by the developers—no condominims, but a lot of ranches, farms, fish camps and RV parks. The people are country folks who work hard and play harder. I thought it would be a great place to drop my sophisticated, Connecticut-raised protagonist and see how she fared fitting in. She seems to be doing well. She’s won the hearts of many of the locals, but also offended a few as she sticks her nose into murders. I see that Eve is one busy girl. How many books are in the series? Old Bones Never Die is book 5 in the series. A Secondhand Murder was the first followed by Dead in the Water, A Sporting Murder, Mud Bog Murder, and now Old Bones Never Die. In each book Eve takes on a killer with the help of a motley crew of family and friends including a Grandmother, Eve’s best friend, a hunky detective, a mob boss, a handsome Miccosukee and his grandfather and assorted ranchers, and, of course, some very bad dudes. I haven’t had the chance to read any of the previous books. Does the reader need to read the books in order to get a grasp of the story? A reader can read them in any order, although, because I’ve had Eve change and grow as she’s adjusted to life in the swamps, I think the reader might like to follow her growth and that of the other characters in the books. I am always curious what the author thinks of this question. What actress would you place in the role of Eve. I’m not crazy about that question because I don’t see many movies. I prefer looking at Netflix, the British programs, and I don’t think there are any English actors who would do Eve or any of the other characters in the books. What hunky actor would play Sammy? The same goes for actors. There are few American actors who I see playing a Miccosukee and too few Native Americans available for the role especially because Sammy is so much taller than most Indians. Although he is part white, his soul is essentially Miccosukee. I think that demands someone part Indian. I always enjoy getting to know some of the sub-characters in a book. And I choose my favorite when I write a review. Do you have a favorite in Eve’s circle of friends and would be sleuth’s? I like Eve’s mob boss friend, Nappi Napolitani because I let the stereotype of a crime boss lead the reader into making assumptions about him, but most of them I take on and reveal how untrue they are. Nappi is a warm, supportive, loving man, a gentleman with a lot of “connections,” yet he’s never been found guilty of a crime. It’s also doubtful that he’s ever been responsible for killing anyone. The most egregious crime we see him commit is helping Eve do some breaking and entering in the first book. Along with Eve’s grandmother, Nappi just “gets” Eve and supports her snoopy nature. He uses his reputation as a tough guy to threaten people into cooperating with him. He rarely loses his temper or gets physical with anyone. At one point in this book Eve realizes she doesn’t know much about him and she begins to wonder if he really is a mob boss. I really enjoyed reading Old Bones Never Die can you tell us how you came up with the title? The bones uncovered by one of Sammy’s relatives date back over thirty years. The person responsible for burying them hopes they never will be unearthed because of what they say about a crime committed then, but these old bones may be buried, but their story will never die. Eve always does seem to get into some fixes and I am sure there is another installment coming soon. Can you tell us if there will be any new character’s added to the cast? I like to keep the old characters that I’ve developed as important in Eve’s life, but I also think a story can be kept fresh if new ones are introduced. There are new ones coming in eh future, people from Eve’s past who reenter her life in unexpected ways. introducing Eve to any of the other ‘sassy country girls’. Maybe working a case together? I’m afraid that might be too much sass, but it would be interesting to see whether the sass of each gal gets in the way of the others. I suspect there might be some competition for center stage because they are all such bold characters. Hera Knightsbridge, the brewer in my microbrewing series set in Upstate New York thinks she can go it alone and doesn’t need anyone’s help until she realizes her brewery needs an injection of cash to stay in business. Her application for a loan is refused when she becomes the prime suspect in the murder of a brewing competitor. Hera becomes determined to find the killer so she can clear her name, but she might just need the help of an old lover and the present sheriff in the county. Hera sounds a little like Eve in personality, doesn’t she? Both Dr. Laura Murphy, the professor in the Laura Murphy series and Emily Rhodes, the retired preschool teacher turned bartender in the Big Lake Murder mysteries are unlike Eve in physical make-up—she’s tall and slender and they both are short and a bit chubby—but they reflect Eve’s tenacious determination to take out the bad guys (and gals). So that a lot of estrogen fueled power surges in one room if I paired even two of them! I did a blog once where I brought some of my women together to talk about me. It was great fun and I might try that again. Most of them thought I was quite a boring person, but they seemed to like one another. I guess I should let you go now so you can get back to Eve and the gang! Thank you so much for chatting. Definitely a great beginning and a promising start. I enjoyed this debut novel by Melinda Mullet. Congratulations Melinda for keeping me spell bound and intrigued. Although I really enjoyed this book it took me awhile to read. Perhaps because I was reading on my phone which is usually a much slower read for me. I enjoyed the mystery and suspense of the story. As I read I wondered about the main character Abi the main/sub character Phillip her friend and business associate. And I was intrigued with Abi's uncle. As I read I couldn't help but wonder if the the characters were introduced in a preceding book. Which I realized when I was finished reading; this was not the case since Single Malt Murder is a debut novel and the beginning of a series. This was not a negative for me in fact I felt like I wanted to know more about the characters. I look forward to and hope that these characters history is revealed in future installments. producing Whiskey. It was very interesting. I felt a part of the story as the reader going along with Abi as she investigates the murder and as she is stalked and ends up running for her life as well. There were great twists and turns that keep the reader engaged and interested and waiting to find out 'Whodunit'. Did I figure it out? I had my suspicions. Single Malt Murder was a fun and cozy read. I look forward to the chance to read future books in the series. I received a complimentary e-copy from Great Escapes Book Tours. This review will be posted at Amazon, Barnes and Noble. Bringing a new dog into the household should be one of life’s happiest events. The process always starts with excitement and high expectations. Too often, though, it ends in disappointment. The new puppy wakes everyone three times a night, gnaws on furniture, piddles everywhere, knocks the children down. The new adolescent dog is too wild. The new adult dog growls at your neighbors. And where did all this dog hair come from? Most people spend hours researching a new mattress, days researching a new car, and weeks researching a new home or job. Yet for a new dog, a companion for the next 10-15 years, the most they do is visit the nearest shelter or pet shop and buy whatever looks cute and appealing. It’s no wonder they end up disappointed. Whether you are looking for a purebred puppy or a charming mixed-breed, the type of dog you bring into your home matters. A quiet owner will struggle to keep up with a high-energy labrador mix, for instance, while an active outdoor family will be impatient with a snoozy bulldog. And finding the right kind of dog means becoming the right kind of owner—a task that takes some forethought and planning. How To Find Your Dream Dog is here to fix the disconnect of dog ownership. It walks you step-by-step through the process of choosing the right type of dog for you—not only exploring the canine qualities that can determine your perfect puppy, adolescent, or adult dog, but also assessing your lifestyle to make sure you’re a good match for the dog, too. The book also looks at good (and bad) sources for finding healthy and sound pet dogs, gives guidelines for evaluating individual puppies, and warns of some red flags to watch out for during your dog search. With this guidebook in hand, you can be confident that the next puppy or dog you bring home will be the right companion and friend for you for the rest of its days. knowledge and resources that I didn't realize I needed. The information Dixie provides is this book is relevant for anyone considering adding a new dog to the family. Whether a seasoned dog owner like myself or a 'newbie' (a first timer) anyone can find useful information. For the seasoned owner things/practices have changed over the years. People are much more knowledgeable and professionals like Dixie are able to offer knowledge from years of practice. Back in the day you just went and looked for a puppy fell in love and took it home. And hoped for the best. I remember when we bought a puppy that was still very young and missed his mother and litter mates. We were up all night. It was like having a new born again. It's different now. There are many resources. And Dixie spells it out and guides the reader through the process. I recommend this book for anyone considering adding a new member to the family. This review will appear on all retail sites where the book is available. This review will appear on Good Reads and My Reading Journeys. I received a complimentary copy from I Read Book Tours. An interview with the author . . .
Hello Dixie. Thank you so much for taking the time to visit with me and talk about your new book How To Find Your Dream Dog. Can you tell us a little bit of ‘your story’. Did you have dogs growing up? Did you have cats? Hi Sherry! When I was about five, my family got the most wonderful puppy. “Lulu” was a medium-sized white dog with black and brown splotches; a real mixed-breed. She was a fantastic dog. When I was 17 I got an Airedale puppy; I wanted a dog I could do competition obedience with, and in those days mixed breeds weren’t allowed (thankfully that has changed). I also had a lovely gray-and-white longhair cat named Tammy. She and Lulu were the best of friends. Do you have favorite breed of dog? For myself? The two breeds I have now appear to be very different but they actually have a lot in common, and they both suit me wonderfully well. I have a 10-pound, 15-year-old Papillon and a 90-pound, 6-year-old Beauceron. These are the dogs pictured with me on the cover of my book. Guess which is the boss? I have four cats, too, by the way, and they boss both dogs equally. Can you tell us briefly about your professional background? I have been working with people and their pet dogs since 1983. I founded two rescue organizations, one of which (Seattle Purebred Dog Rescue, Inc.) will have its 30th anniversary this year. I moved from obedience training my own dogs to assistant-teaching classes aimed at pet owners, eventually becoming the Director of Training for Greater St. Louis Training Club, Inc., for five years. A friend and I formed our own business, Dogs Unleashed LLC. We went to people’s houses to work with training and behavior problems for five years. Meanwhile I was getting trainer certifications from the Certification Council for Professional Dog Trainers (the only independent organization that certifies dog trainers) and the challenging Karen Pryor Academy for Animal Training and Behavior. Finally, I decided to try to reach a wider audience through writing a book - eventually more than one, I hope! Give us the short version (if there is one) why you chose to write the book at this point in your career? Have you been thinking or planning about it for awhile? Oh yes. How to Find Your Dream Dog grew out of one of the most frustrating and frequent experiences during my 30+ years in the pet dog training world: trying to help hopelessly mismatched dogs and owners. Sadly, most dogs are picked up on impulse, and most of those dog/owner combinations are not successful - which is why our shelters are now flooded with out-of-control young dogs; former puppies who turned into dogs their owners didn’t expect and didn’t want. My dearest wish is that my book helps people stop, think, and plan for success before they get their dogs. Did you write the book for a target audience or age group? I think, and hope, that anyone from older childhood on through adulthood can read and learn from this book. I have gotten great feedback from several people who have read the book aloud with their families. I think we all want to find our ‘dream dog’ how important is it to consider breed? Do you cover this topic in your book? I do cover this important topic in my book. It is very important to consider type. If you discover through research that a Labrador Retriever is your dream type, then any dog who looks and acts like a Labrador is very likely to be a success for you, regardless of whether it is a purebred or not. Dogs of different types have different genetic backgrounds, different needs, and different behaviors. One of the best paths to successful matchmaking between owners and dogs is for owners to decide which doggy behaviors and needs they can live with - ideally would enjoy living with - and find a dog in which those occur naturally. Is it better to get a purebred dog or a ‘mixed’ breed, something to consider if a family has children? That sounds like such good information. Let me ask you one more question before we go. I know anytime I’ve considered adding a new pet to my family I’ve always been anxious and wanting to hurry up and bring one home. Can you tell us how important it might be to consider taking time when making a decision. Is there a magic number of days or weeks or months? Everyone feels that way. Even I do! I want my perfect dog, or puppy, right now! But we need to ask ourselves, do we want every day with this dog to feel easy and natural? Do we want this dog to fit into our lifestyle? Consider this: every single adolescent dog in a shelter is there because it was someone’s wrong choice. The only way to ensure that you end up with not just any dog but your dream dog, the dog you want to keep and love forever, is to do your research. That actually doesn’t take very long, and my book streamlines that process. I definitely feel better qualified to bring a new addition to the family. Your book indeed shares some valuable information. Thank you so much for sharing with me today. Thank you for featuring my book! Good luck to you and all your readers as they look for and find their Dream Dogs! Connect with Dixie . . .
Jax O’Connell and her friend Tessa have no idea what challenges await them when they head to the small town of Carthage to take a glass blowing class with Marco De Luca, a famous Italian glass artist. While Jax loves melting glass to make beads, she discovers that standing in front of the glass furnace’s inferno frightens her. After the first night of class, Tessa sees a dead body through the water-streaked window of the studio. The next morning there’s no sign of Marco—dead or alive—and one of the studio owners is also missing. The local sheriff doesn’t take the disappearance seriously, so Jax and Tessa take matters into their own hands. Jax must face her fears to find the body, track down the clues, and uncover the killer—and do it all before another life is shattered. Off the Beadin’ Path is the third book in the Glass Bead Mystery series. Janice Peacock decided to write her first mystery novel after working in a glass studio full of colorful artists who didn’t always get along. They reminded her of the odd, and often humorous, characters in the murder mystery books she loved to read. Inspired by that experience, she combined her two passions and wrote High Strung: A Glass Bead Mystery, launching a new cozy mystery series featuring glass beadmaker Jax O’Connell. When Janice isn’t writing about glass artists-turned-amateur-detectives, she makes glass beads using a torch, designs one-of-a-kind jewelry, and makes sculptures using hot glass. An award-winning artist, her work has been exhibited internationally and is in the permanent collections of the Corning Museum of Glass, the Glass Museum of Tacoma, WA, and in private collections worldwide. Janice lives in the San Francisco Bay Area with her husband, two cats, and twelve chickens. She has a studio full of beads…lots and lots of beads. Thank you Great Escapes Book Tours for providing me with a complimentary copy. Click Here to visit the tour. After a stalker went too far, Hannah Hilty and her family had no choice but to leave the bustling Amish community where she grew up. Now she’s getting a fresh start in Hart County, Kentucky…if only she wasn’t too scared to take it. Hannah has become afraid to trust anyone—even Isaac, the friendly Amish man who lives next door. She wonders if she’ll ever return to the trusting, easy-going woman she once was. Described as suspenseful. And it is. I would not add thriller to the description which I think sometimes becomes part of a book with this type of story line... A suspenseful tale of a young Amish woman who is forced to move to a new town to escape a threatening stalker. I was not on the edge of my seat. But I will say I picked this book up yesterday at around 10 a.m. about 12 hours later I turned the last page . would say so. The story flowed in a steady pace from page 1. It did pick up rather quickly nearly to the end when it's discovered the stalker is in town and up to his old tricks. I have to say I really loved the main characters Hannah and Isaac. They were a pleasure to get to know. This wasn't a story where they meet, get together, have conflict, then get back together in the end. They pretty much met, became friends then became closer friends and ended courting with plans to marry in the end. There was no family interference or other distraction for the couple. In fact everyone seemed to agree that Hannah and Isaac were a great couple. The stalker really only made a very brief appearance at the very end when his identity was revealed at about the same time he became bolder in his activities. The characters really didn't seem to jump off the page for me. In fact I actually didn't really like Hannah's family. The drama and trauma of the stalking which preceded the move to a new town basically caused the entire family to blame Hannah. Their treatment of her including her parents I thought was a bit harsh. The parents had some personal underlying difficulties and did redeem themselves in the end but I just didn't connect with them or the other children in the family. Hannah's younger sister played a big part in the story. Her character did not display the religious beliefs of the family and acted out in ways that caused Hannah more trauma. I enjoyed Her Secret. I really like a book that I can't put down! I received a complimentary copy from Litfuse. This review will appear at retail sites were the book is available. Visit Shelley's website for additional retail links. Social Media links. Click Here. On My Reading Pile. . .